BH: Tell us a little bit about yourself. Lynn: My name is Lynn Mohney, of Prunella’s Workshop. 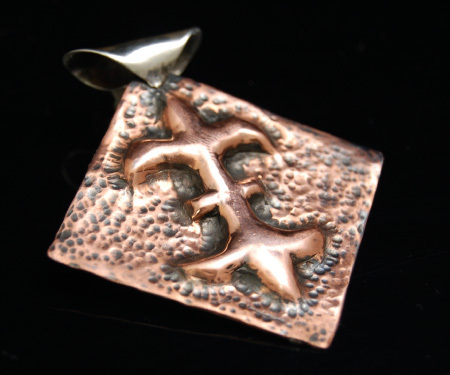 We are a one and a half person business comprised of my husband, Duane, and I. I am a fulltime metal smith. Duane calls himself my minion, but he is the technical engineer/problem solver part of the business, when he is not at his full-time other job. Prunella’s Workshop is located in Leominster, MA, where I live with one husband, a near seven year-old boy, an 18 month old girl, and two cats. We create metal jewelry and clothing accessories based upon research of similar pieces from the medieval period. I began to think of art as my vocation when I was in sixth grade. As a result, I went to Assabet Regional Vocational High School, where I focused my studies on graphic design. I then went to Notre Dame College (now defunct) where I obtained a bachelor’s degree in liberal arts and graphic design. While there, I was trained in costume designing in addition to my studies, and eventually had the opportunity to design the costumes for an entire production. I set out in the world thinking I would write and illustrate children’s books (a dream that is still alive and well but unfulfilled.) Instead, I began a master’s degree is school psychological counseling, which was not completed because, as said in the jewelry world, I was distracted by something shiny. BH: Where did you get the name Prunella’s Workshop? Lynn: This is a frequent question I am asked by my customers. Mostly it comes from my love of fairy tales, which is highly reflective in my work; however, I also named my business after my son. We have a family tradition of giving babies nicknames from fairy tales prior to being born. Prunella was one of the Wicked Stepsisters in Cinderella, and seemed fitting. The nickname was dropped upon birth, but lives on in my creations. BH: When did you begin metal smithing? 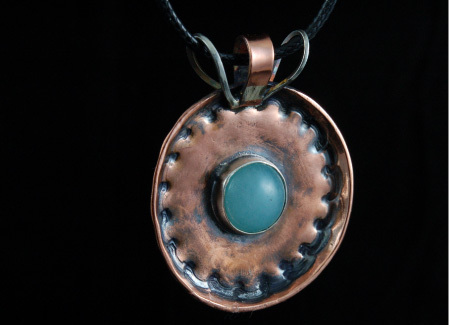 Lynn: I took my first class at Metalwerx, in Waltham, MA in 2005, and I was immediately hooked. Within two years, I decided I wanted this to be my vocation, and started Prunella’s Workshop. However, it was not until August 2012 that I was able to resign from my 15 year-long office job to pursue my craft full time. BH: What was the first thing you can remember making by hand? Lynn: That would have to be dyed macaroni necklaces in the library when I was around three. I come from a crafty family, so it is really hard to remember when I began doing art. My grandmother was an artist, but her mother would not let her go to art school because it was not considered lady-like. My mother made all of my clothes until I hit that age where other kids made fun of you because your clothes did not have labels. Which was a shame, because my clothes were nicer than theirs. When I was six, I drew a portrait of my Mom for Mother’s Day, and it got in the newspaper. It apparently looked so much like her, friends called to tell her. I remember later sewing costumes for all of my Barbie dolls so they could put on a production of Peter Pan. However, I actually remember making the macaroni necklace best! BH: Please describe your artistic process. Lynn: I often start by just drawing out ideas or having a picture in my head of something that has been inspiring me. And then I make something else! Seriously, I have as many drawings of jewelry I should make some day as I do actual completed work. Every once in a while I actually make something I have drawn. Yet just drawing out ideas clears the clutter in my head so I can get started. Sometimes I start out just going through resource books and museum websites for inspiration. I usually start with a sheet or wire of sterling silver or copper. Sometimes the sheet is pierced into an intricate design, or receives a hammered texture. The wire is usually twisted and soldered. 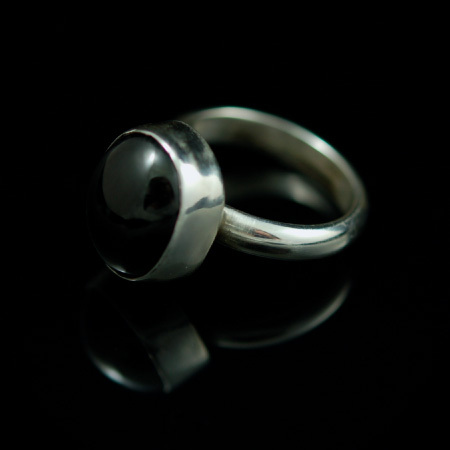 I do some stone setting, but my focus is on the way the metal moves and flows at my command. When one first starts metal working it seems inconceivable that one could have any control over something so cold and hard; however, metal is incredibly malleable if you understand how to work it. I love forming metal with hammers, and I will admit, there is a little pyro in me just waiting to get out and use my propane torch. BH: Where do your ideas come from? Lynn: I am inspired by the medieval time period, with focus on the Italian Renaissance and the Elizabethan period. My husband adds in his love for the ancient Vikings and the Celts. All four show up in my work quite frequently. I like to take it a step further than just jewelry or accessories that are slightly reminiscent of times of yore. For example, I research the actual clasps that were used, and in some instances try to recreate them, if feasible. I will do actual reproduction work, but I prefer to try to come up with designs I feel could have been created at that time using techniques they would have used. 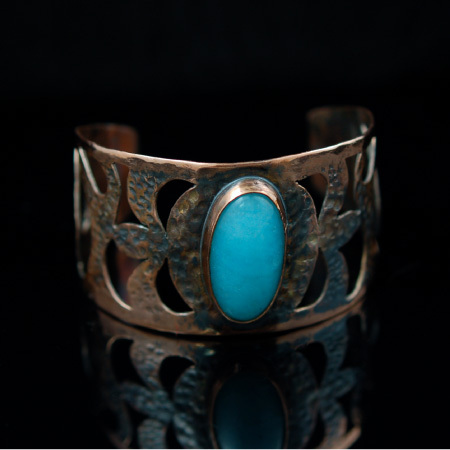 I am quite awed by the fact that modern jewelry is often quite similar to what was worn as long ago as B.C. Not all of my work is focused on a period in history. As I mentioned before, I have a deep passion for fairytales. I am fascinated by the concept of stories told in the oral tradition that have been told so many times in so many ways that they are deeply ingrained into who we are as a species. For example, just about every culture has a Cinderella story. I fear this tradition is dying, and fewer people know the stories. When I am not sharing a piece of history with my followers, I want to share a story. BH: Are there other mediums besides metal that interest you? 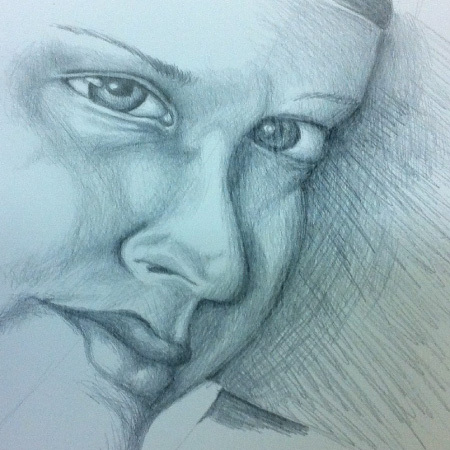 Lynn: I love to create portraits of people, especially in watercolor, though I have started some exploration in doing them in silverpoint. I enjoy painting. I love to hand sew and embroider. I have always wanted to try a pottery wheel, but have not had the chance. I have also wanted to try marble sculpture, but I have not gotten there yet. I also really love costume designing. I am working on a full length novel, as well. 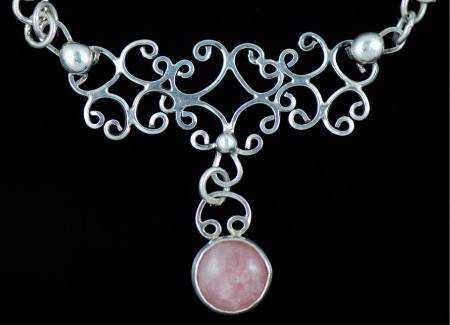 Lynn: I currently have my own website at http://www.prunellasworkshop.net. I sell my work on Etsy at https://www.etsy.com/shop/PrunellasWorkshop. I also have a Facebook page where I promote my work as well: https://www.facebook.com/PrunellasWorkshop. We can also be seen at a variety of craft fairs, and we keep our calendar updated frequently. BH: What are your favorite movies? Books? Music? Lynn: The three very best movies in the world, not in any order, have to be Princess Bride, Bambi, and the original Psycho. Choosing my favorite books is rather hard, as I love to read more than anything, but if I must choose, Little Women by Louisa May Alcott, Rebecca by Daphne DuMuarier, Harry Potter, and Grimm’s Fairy tales are all goo d contenders. Ask me tomorrow and I will change my mind. My music selections are very eclectic, but I mostly listen to soundtracks to musicals while I am working. Weird Al Yankovic is my hero, as I am a nerd at heart. I love Simon and Garfunkel, Joni Mitchel, Billy Joel, and the Bare Naked Ladies. I love music, and I am amazed by the talent out there, especially as I am completely tone deaf. Lynn: I am currently reading the second book in the Girl with the Dragon Tattoo series. I mostly ready fiction, though I have been known to curl up with a good jewelry book. My son has been reading Howliday Inn by James Howe to me. It was the first mystery I ever read, and now it’s his. Watching his face light up as he figured out “who dunnit” was pretty darn cool. BH: Where do you see yourself in 5 years with your art? Lynn: I hope that in the next five years I will have continued to grow and develop, constantly taking the quality of my work to the next level. I never want to feel like I have reached the point where my work is “good enough,” as I believe we can always strive to be better than we are today. I hope to have developed a client base who respects the quality of my work and to have an established strong business.